The first part consists of stories about cardsharks and other crooks from Robert-Houdin's recollections. This is very readable and an entertaining part of the work. The second part explains some of the technical details of the methods used by cardsharks. However, the methods are for the most part only described in very rudimentary form. 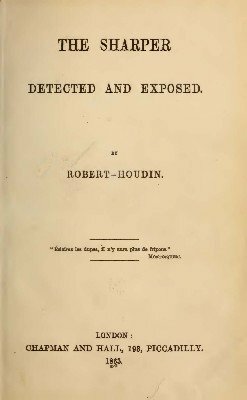 As Robert-Houdin writes himself, this is not meant as a way to teach you how to do it, but merely to give the reader insight in how the different ruses are accomplished. Nevertheless, it provides interesting insight into the ways and means of cardsharks. 1st edition 1893, 268 pages; PDF 140 pages.